We have all heard that 2019 is going to bring a change to a lot of things for us, this holds true especially for kitchen backsplash tile designs. 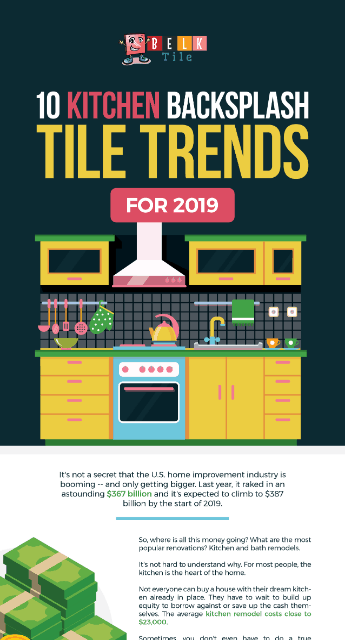 This infographic will show the Top Ten Tile Trends to look for in the new year. The shift to a more streamlined look with larger format tiles, not just with a 6 x 12 glass subway tile or ceramic tile, but more to the effect of a 12 x 24 and even 6 x 36 size. The use of a more ornate, waterjet and/or decorative mosaics will be popular in 2019. The biggest change will be the use of porcelain waterjet designs will take the front seat to the marble tiles that have been popular in years past. Covering more of your wall for example, above the sink and stove and going all the way to the ceiling leaving no space to see any type of painted surface. Metals and mirror tiles will grow more with popularity offering different sizes and shapes. These will be just some of the popular choices in 2019 for kitchen backsplashes.